Since October 15, 2018, drivers in Prievidza can pay parking fees in a cheaper and more convenient manner thanks to the mobile parking app ParkDots. ParkDots will bring a new option for paying parking fees, for example for foreign visitors to the city who cannot make payments via SMS, and more efficient control of adherence to parking regulations. During the checks, you can simply take a photo of the vehicle’s registration number with your mobile phone and the system will immediately inform you whether parking fees have been paid. 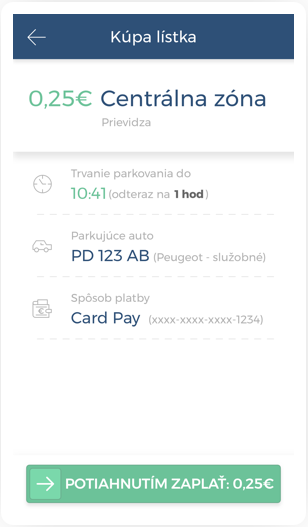 By launching parking fees payments via ParkDots along with currently available SMS payments, Prievidza will provide drivers with new options and even cheaper parking fees in the first hour. “We believe that a better price will motivate city visitors to try this new form of parking fees payment as soon as possible. A payment of 25 cents for the first hour is proof enough that the city's long-term goal is not to achieve the highest possible returns from parking fees but rather to regulate static traffic in the central city parking zone,” says the Mayor of Prievidza, Katarína Macháčková. Residents and visitors can conveniently pay parking fees via the ParkDots mobile app. Owners of business mobile phones or foreign visitors who cannot pay via SMS will also be able to make payments without any problems. Upon the expiry of their parking ticket, they will be notified and offered to conveniently extend their parking time from anywhere. A simple app can be handled easily by any smart phone user. The city of Prievidza hopes that ParkDots will bring a more effective collection of payments which are to be invested further into improving static transport in the city. The advantage of this solution is also the mobile app ParkDots Enforcement to check and “scan“ a vehicle’s registration number, enabling the integration of all payment channels and effective checks of parking eligibility. “We have chosen ParkDots specifically because it is modern and simple to use for both drivers and the city. It offers us a profitable business model and very important integration into the existing systems. It is possible to further develop it and expand its functionality with other modules. These are benefits which will hopefully lead to improving the parking situation in the city,“ said Roman Bartoš, Head of the Parking Department of the Technical services of the city of Prievidza, justifying the choice of ParkDots. “ParkDots has got parking checks sorted out. You can simply take a photo of a vehicle's registration number with your mobile phone and immediately find out whether parking fees have been paid. Based on this, we hope for substantial acceleration of checks and improvement of discipline, which will help the city and other drivers as well,“ he added. ParkDots is the official smart parking solution of the Deutsche Telekom group, developed by the company PosAm. The key elements of the parking platform are the mobile app for users and the central control system located in the cloud. The latter can be complemented by inconspicuous road sensors that send real-time occupancy information related to a particular spot, or the mobile app ParkDots Enforcement that scans a vehicle’s registration number to check parking eligibility. “We are convinced that Smart City solutions have great potential, which is regarded in the same way by the Deutsche Telekom group, to which PosAm belongs. We believe that together we will be able to establish ParkDots, a Slovak product, all over Europe“, says Michal Bróska, Chief Product Officer at PosAm, about the ambitions of ParkDots. The ParkDots app is free for both Android and iOS smartphones. In addition, its key features are also available within a fully responsive web app at https://map.parkdots.com.